Get more information about the Fuller Center here! Click on the "pictures" buttons to the left of the screen to see pictures of my adventure! From Louisville, Ky to Americus, Ga, this is over 500 miles. Millard Fuller walked from Americus, Ga to Louisville, Ky Surely I can bike it! We plan to depart from Boston Ct., Louisville, Ky on July 26th, 2008. 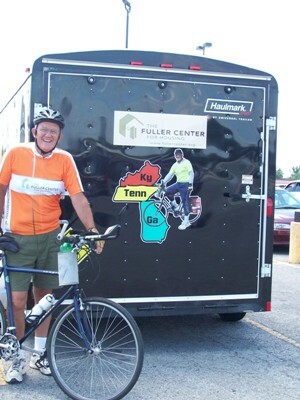 We plan to join Ryan Iafigliula and his bicycle tour across America. We will all join Millard & Linda Fuller in Americus on August 4th, 2008 for a Fuller Center Blitz Build. You can sponsor by the ridden mile or a straight out donation. All funds collected go directly to The Fuller Center for Housing. We are a 501c3 non-profit, so tax deductions are available. Send donations to the address found below or give us a call with any questions you might have! Our Mission: The Fuller Center for Housing, faith driven and Christ centered, promotes collaborative and innovative partnerships with individuals and organizations in an unrelenting quest to provide adequate shelter for all people in need worldwide. Prayers and words of encouragement are more than welcome!! They made and donated the wonderful stickers found on our poop-out wagon!! To make a donation, please mail to this address. Or give us a call with any questions you might have!